This blog post marks the half way point of FUND’s presentation of data from a 2014 research project examining CDFI Boards and Fundraising. So far, we have demonstrated how CDFIs lag behind the general nonprofit sector in utilizing boards for fundraising. Additionally, we have presented data on CDFI board size and structure, and examined the skill sets that CDFIs look for in board recruitment. 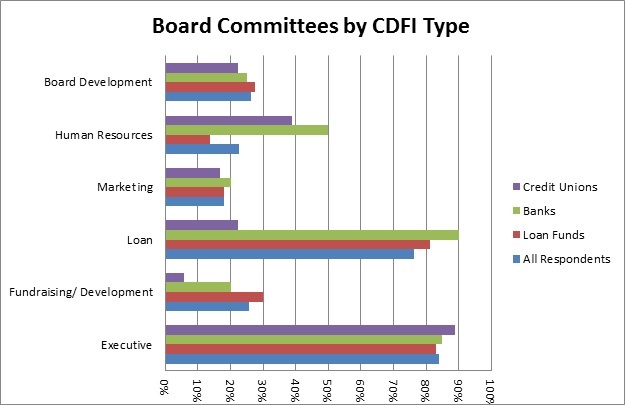 This week, we take a look at CDFI board committees. The FUND survey included questions designed to determine the most common committees on CDFI boards, and whether or not CDFIs used committees to help in fundraising efforts. CDFIs are most likely to have Executive and Loan Committees. Approximately 25% of CDFIs have Fundraising Committees. Loan Funds are slightly more likely to utilize a committee to help with fundraising, with nearly 30% of all loan funds reporting having a designated fundraising committee. Once again, this is in sharp contrast to the general nonprofit sector, with over half of nonprofits reporting having fundraising or development committees according to a 2012 survey conducted by the NonProfit Research Collaborative. In this study, those who had a fundraising committee were more likely to achieve fundraising goals, with 63% of those with fundraising committees meeting goals vs. 52% of those without a designated committee. With studies showing that board fundraising is an effective way to reach fundraising goals, it is surprising that more CDFIs do not utilize boards for this function. Does your board have a fundraising committee? If not, why? In next week’s blog, we will examine data showing CDFIs that have experienced board resistance to fundraising as well as strategies used for board fundraising.